The area known as the Barrio de las Letras (Literary Quarter) is a neighbourhood in the centre of Madrid where some of Spain's greatest literati have lived and written over the years. Today it is an area which combines literature, a bohemian atmosphere, entertainment, shopping, and good food. The neighbourhood is formed by narrow streets which are either pedestrianised or with restricted access to traffic, and pleasant squares such as the Plaza de Santa Ana. This is an area where it is easy to find houses in which towering literary figures of the Spanish Golden Age such as Lope de Vega, Quevedo, Góngora and Cervantes lived and wrote. This is why on the cobbles of many of the streets you'll find inscriptions and brief texts from the works of some of these writers. Another of the charms of the Las Letras quarter is its abundant offer of shops and businesses, which include everything from the most traditional establishments with centuries of history (such as cobblers, silversmiths and lute-makers) to modern avant-garde venues. You'll also find numerous restaurant and pavement cafes where you can enjoy the gastronomy of Madrid and the popular Spanish custom of 'going out for tapas'. 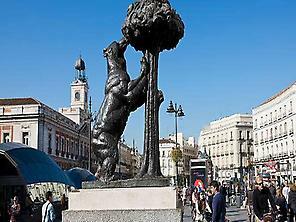 Finally, the neighbourhood is ideally placed for discovering Madrid's cultural offer, as it is the site of the CaixaForum Museum and very near the Prado and the Thyssen-Bornemisza museums, as well as a stone's throw from monumental ensembles such as the squares of the Puerta del Sol and the Plaza Mayor.